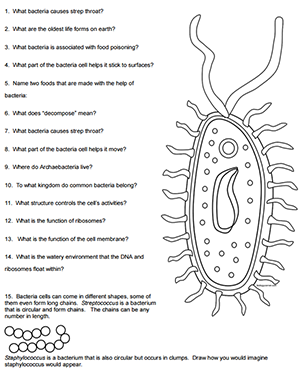 This worksheet is similar to the animal cell coloring and the plant cell coloring, where the focus is on structures found in the cell and how those structures relate to the cell’s function. Students read a short passage about prokaryotes and the two kingdoms of bacteria: archaeabacteria and eubacteria. The passage includes information about how bacteria can be helpful in making food and as decomposers in the environment. Students must color the image according according to the descriptions in the instructions. These descriptions also include the functions of the structures found in bacteria: pilus, flagella, DNA, plasmid, ribosomes, cell membrane, and cell wall. Students must answer questions from reading the instructions and introductory text.